Bullock Smith & Partners, Inc. Gross Area: 180,871 sq. ft.
Area Per Student: 169 sq. ft.
An interesting accomplishment on what was a very challenging site. 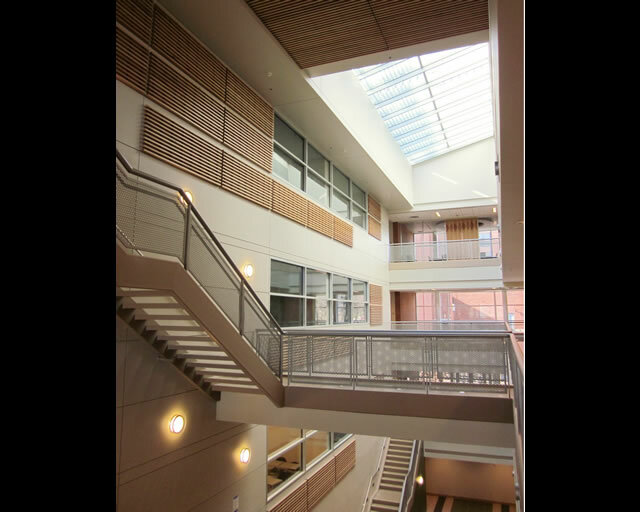 Accomplished a fit with existing campus architecture. 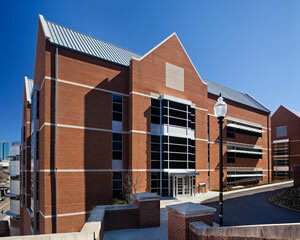 The Min Kao Building, on the Knoxville campus of the University of Tennessee, is named for a generous donor, Dr. Min H. Kao, for the funding of the project. A UTK alumnus, he was co-founder with Gary Burrell of the Garmin Corporation (hence its name), and is credited with the breakthrough design and engineering of its GPS software technology. 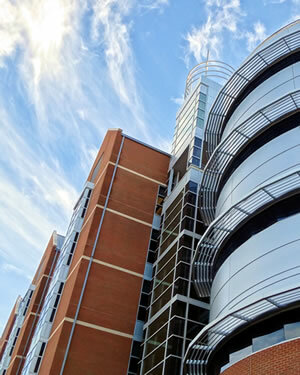 The building houses a department that was previously two separate teaching and research entities, now combined as the Department of Electrical Engineering and Computer Science. 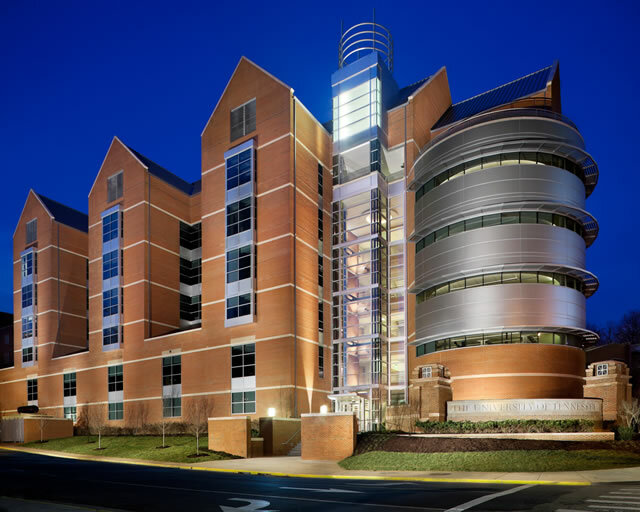 Shared needs, shared faculty, and inadequate existing facilities led to the programming of this combined department, and the search for an appropriate site for a new building. The university had a policy of siting its science, engineering and technology facilities in close proximity whenever feasible, both to facilitate convenient class adjacencies and to promote interaction among students and faculty. The one physical problem with this laudable goal was the rapidly diminishing number of viable sites for new construction in the area of campus that has evolved over time into a focus area for science facilities. “The Hill”, the oldest part of the campus and the site of its earliest buildings, is the hub of this focus area. It is also notable for its handsome ensemble of collegiate gothic structures, the most admired district of the campus from the standpoint of architecture and open space definition. It is topographically prominent, with buildings surrounding its hilltop quad and then descending significant slopes in all directions. Once a space program for this new facility was devised, projections of area requirements exceeded 180,000 gross square feet. As opposed to more remote possible locations, the university chose a 1.3 acre site on the eastern flank of The Hill, facing a prominent point of entry to the campus from downtown Knoxville. Partially wooded, it had remained undeveloped for two reasons: its very limited developable acreage, and its steep slope. It was immediately apparent the new building footprint would need to occupy the large majority of the site, and that its lowest levels would need to “stair step” up that slope. These unusual factors constituted the foremost challenge of the project. A planning committee was constituted, led by the department head and including representatives from the faculty, administration, student body, and design professionals. This group met on a regular basis over an extended period of time, gradually assembling shared goals for programmatic needs, architectural preferences and budgetary limitations. Convenient adjacency of offices to labs. 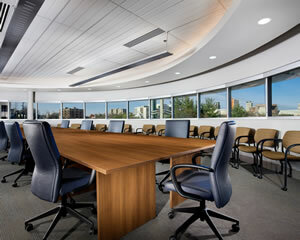 Groupings of offices with shared common spaces. A central focus: a sense of place and identity for the department. Exterior architectural treatment that respects nearby collegiate gothic buildings, but is expressive of cutting-edge technology: a paradoxically difficult challenge! Exterior architectural treatment that affords a sense of “gateway” to the campus from the downtown. 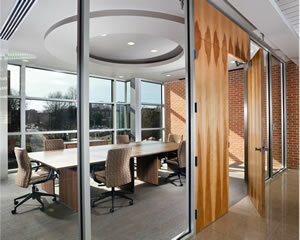 Natural light and views for all appropriate spaces. 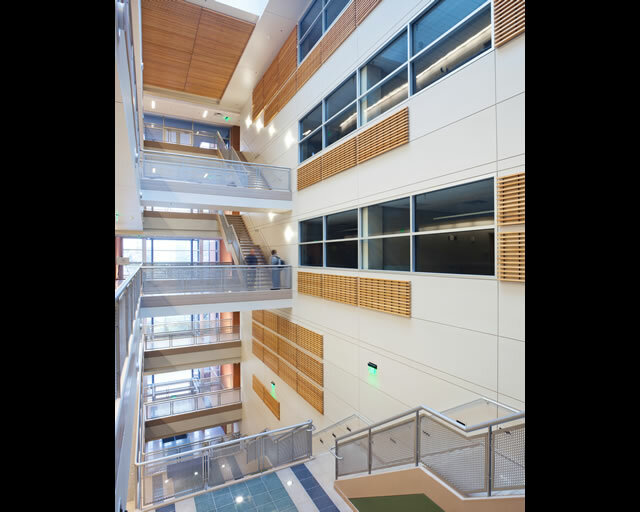 The combined departments required significant numbers of labs, faculty offices, graduate student offices, classrooms, conference rooms, and study or lounge spaces. An initiating concept placed the nearly equal areas of lab and office spaces opposite each other along generous corridor spines for convenient mutual access. The labs themselves, whether for teaching or research, were to be arrayed in rows and divided by non-load-bearing walls, permitting them to be combined in one way or another as desired in the future. 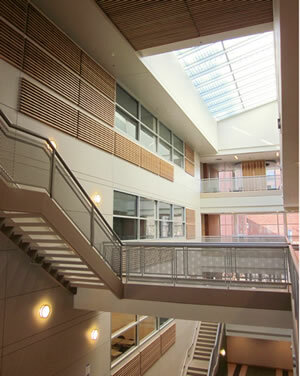 The large majority of the labs were provided with generous natural light. One floor of research labs was below grade, as necessitated by the insistent limitations of the sloping site, but is desirable for experimental procedures requiring exacting control of light conditions. Being devoted to electrical and electronic issues, requirements for specialized utilities serving the labs were not as extensive as, for example, in biotechnology facilities. While private offices were a requirement for all faculty, most offices were arranged in “pods” that share modest anterooms, accessed in turn from the spine corridor via generously glazed entries. “Bulletin board control” was a consideration, and pinup boards adjoining these entry points help enliven the circulation spaces. The department’s suite of administrative offices and functions was located on the fourth floor, conveniently midway in this six-story building. A number of tiered classrooms and a 165 seat auditorium were also required. Given their special configurational requirements, these were grouped together in a nearly separate wing of the building, with its own entrance, lobby, and nearby restrooms. The top level location of the auditorium permitted “stadium” seating and expansive spatial proportions. 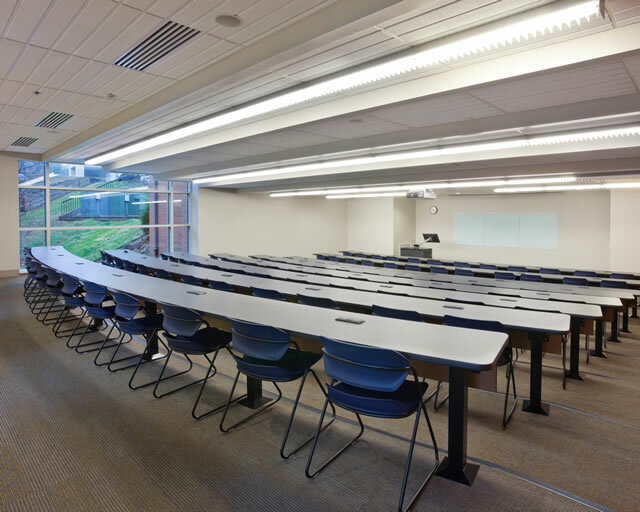 The auditorium and all classrooms were provided with natural light and views, along with means to control daylight when required. In response to the compact limitations of the site, this wing extends laterally to take advantage of an adjoining remnant parcel of open space, while also serving as the building identity and entry for significant foot traffic arriving from the south. 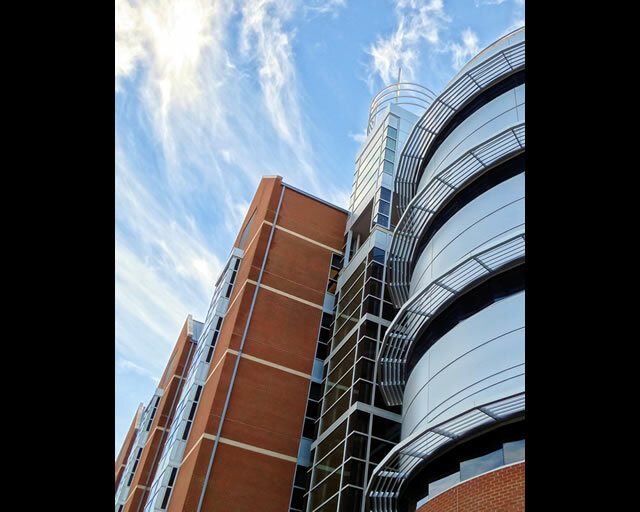 Two utility cores provide passenger elevators and restrooms at locations convenient to all building users, despite the facility’s complex overall footprint. A modest loading entry accesses a freight elevator which connects all levels. The bottom most level, with no access to natural light, was the logical site for an ambitious proposed clean room facility. Design and construction in this area was held in abeyance while complex issues of program and budget were researched and debated. Ultimately this space was finished out otherwise, for additional conference and lab functions. The asymmetrical massing of the building, with a lively roofscape of steeply pitched gables, was specifically intended to recall, but not imitate, the collegiate gothic buildings of The Hill. An accurately historicist treatment would not have been in keeping with the charge to be expressive of technology, and the labor and detail-intensive aspects this would have entailed could not have been met by the budget of the project. That said, carefully matched brick cladding was employed, enhanced with cast stone bands and gable caps. Projecting bays enliven many elevations and recall such bays on the original campus buildings. A “drum” clad in metal spandrels, accommodating conference and study rooms, turns the corner and affords both a sturdy campus entrance marker and the refined precision possible with such high-tech materials. A glazed tower bay, topped with a lantern and sculptural antenna element, marks the first floor entrance and the eastern exposure of the building’s atrium. It is the focal point of the prominent east facade. As opposed to the red clay tile of the original building group, a warm gray ribbed metal roof was used as it is both light weight (a practical matter), and to further signify that this is a building respectful of modernity as well as history. Ultimately the footprint of the building is an “elbow” plus the classroom wing. This maximizes utilization of the site, affords a maximum provision of natural light, and variegates the periphery on the west with a sloped garden court—originally also hoping to preserve a large specimen gingko tree that was ultimately deemed an unrealistic goal given the extensive soil disruption required. By utilizing Construction Manager at Risk early in the Construction Document Phase, the Design Team was able to utilize the Construction Manager to address most cost effective solutions to the many challenges of the unique site, including separate tie back walls for retainage. As for safety and security, standard university protocols applied, highlighted by security card reader access. 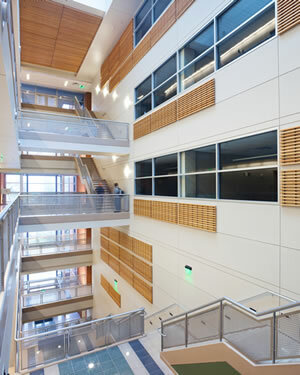 The facility was the first US Green Building LEED Certified project for this campus, and served as a testing ground for many sustainable methods and design techniques which are now standard practice. The stair step nature of the building is directly expressed in the profile of its atrium, a top-lit circulation and lounge space that rises from the first floor entry at the east to the fourth floor entry at the west. This is the desired focus for the department: a spatial integration of all floors that affords opportunities for chance meetings. Some labs directly overlook this space. 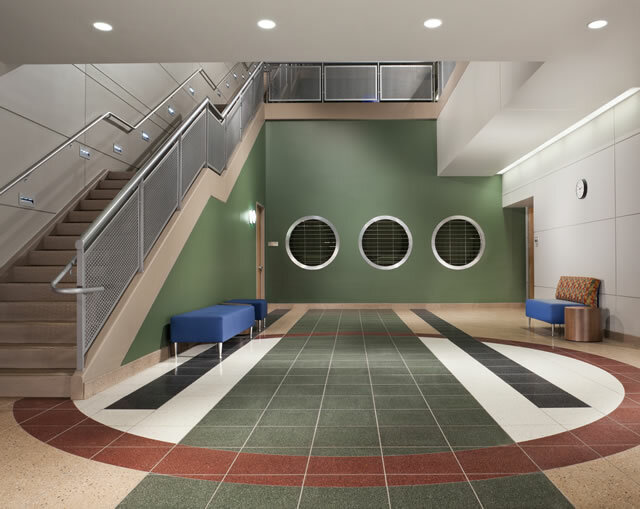 Colorful quartz tile floors extend throughout the atrium and corridors, and accent paint colors in the various corridor alcoves are an economical and effective means to further enliven these spaces. Labs, offices and classrooms all also feature painted accent walls. All corridors terminate in exposures to the outdoors, these termini are also viewed as chance meeting points. The extensive spatial requirements of mechanical equipment were largely met in the cavernous attic. Finally, the sixth floor incorporates some special functions: a commons room, lounges for faculty and staff, and a terrace with expansive 180° views. General Contractor: Blaine Contruction Co.